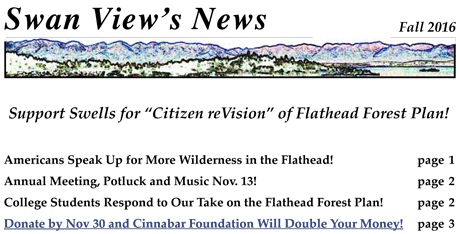 Thanks to your comments and grassroots networking, support is growing for our Citizen reVision of the Flathead Forest Plan! As our Fall 2016 newsletter reports, the Flathead National Forest has received some 35,000 comments supporting the protection of all roadless lands as wilderness and continued wildland recovery via road decommissioning in its revised Forest Plan! We hope to have more specifics in our Holiday newsletter, but know for now that our Citizen reVision has also been endorsed by 39 Tribal Nations acting together as GOAL: Tribal Coalition to Protect the Grizzly, that our annual meeting is November 13, and that this is your last chance this year to have your donation to Swan View doubled by Cinnabar Foundation! We hope you are encouraged by the good news and will join others in supporting our work!